I have been praying for a while for my husband to get a job was let go from General motors in November. Nee to sell our house. Too big. Thank you again and thank you Jesus. I surrender myself right now in this moment and know that you are in control of my life. I rebuke th devil away from all these challenges that have been put in my way. I know that My savior Jesus Christ is with me, guarding and working his precious hands in all this! Please keep my mind peaceful and confident in what I know as victory in the making. I love you Lord, and trust your promise. Thank you Lord. Let your peace remain in my heart. Amen. I thank You for blessed me with Your peace that surpasses all understanding,and release Your peace into my heart. I thank You for keep me savely and rescue me from the darkness of this world. Thank You Father God,to fill me with all joy and peace. My dear Lord Jesus is the way,the truth,and the life. Help me Lord Jesus,to focus on Your ways. I praise and give You thanks my dear Heavenly Father,my dear Lord Jesus Christ,for Your love and Your heart is always for me. So today, I seek to have God in me,wherever I may go,or whatever I do. I thank you dear God,for blessed me with Your peace that surpasses all understanding,and release Your peace into my heart. I give thanks again for keep me savely and rescue me from the darkness of this world. Bring peace in our homes,bless our family member to be at peace with one another. Thank you Lord Jesus,for Your grace and Your love endures forever. I love You my dear Lord Jesus. Thank you Lord for this prayer today. Rescue me and my family from difficulties. Help me to have peace in my family. Amen. I give You thanks my dear Heavenly Father,for allowing me another day. Blessed me with Your peace that surpasses all understanding,and release Your peace into my heart. Keep me savely and rescue me from the darkness of this world. Today I seek to have God in me,wherever I go,or whatever I do. We believe in Christ Jesus, to give us peace in our homes,bless our family member to be at peace with one another. Thank you Lord,for Your grace and mercy endures forever. 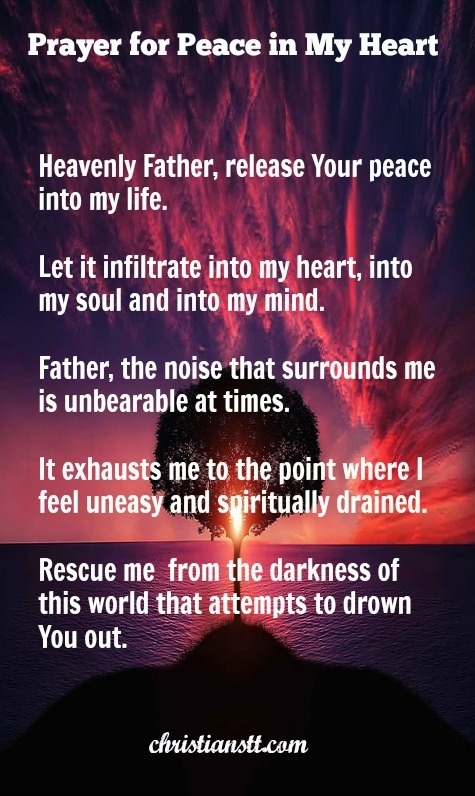 Please pray for my soul and inner peace. I am anxious beyond fear. Amen and Amen!!!!! Thank You Lord. I praise You my dear Father in Heaven. I thank you for give me the peace of God that surpasses all understanding and guard my hearts and minds in Christ Jesus. May the God of hope fill me all day long. Thank you Lord,for this beautiful prayer,full of God word. I praise You and glorify Your Holy name my dear Lord God Jesus Christ, for release me with Your peace into my heart,into my soul,and into my mind. Thank you so much for bring me this beautiful prayer,full of God’s word. Thank you for this prayer TODAY. God bless you. The Devil is trying real hard Lord, i rebuke him in the name of the holy spirit, by the blood of Jesus, Give me peace Lord, i cant do it without you. Joining Cyndi in prayer for your family and for family unity. May the Lord bless you all and fill you with love for each other. Amen. Amen. In the name of Jesus Christ my Lord and my God. My prayer be with you and the Lord will be by your side at all times.